PUNE: To acknowledge the love and trust of consumers in Maharashtra, Samsung India today announced the Never Mind offer for buyers of Samsung smart phones. Samsung has further strengthened its leadership in Maharashtra. Samsung Galaxy J series is India’s most popular smartphone series and the recently launched Galaxy J7 Pro and Galaxy J7 Max have received an overwhelming response. The Never Mind offer is aimed at adding to the joy and excitement of the festive season with a one-time screen replacement offer. Under Samsung’s Never Mind offer, consumers can avail one-time replacement of a broken screen within 12 months of purchase by paying Rs. 990 at the time of repair. The offer is valid on purchases between September 21, 2017 and October 21, 2017. Samsung’s Never Mind offer brings peace of mind to consumers and extends across popular models above Rs. 9,000. This includes the J Series, A Series, C series, On series and flagship S Series and Note Series. Ahead of the festive season, Samsung recently launched its flagship Galaxy Note 8 in India, offering the next level Note for people who want to do bigger things. “Our focus on consumer-centric innovations and providing superior products and services to consumers have made Samsung India’s top brand. The Never Mind offer is our way of thanking the people of Maharashtra for their love and trust. 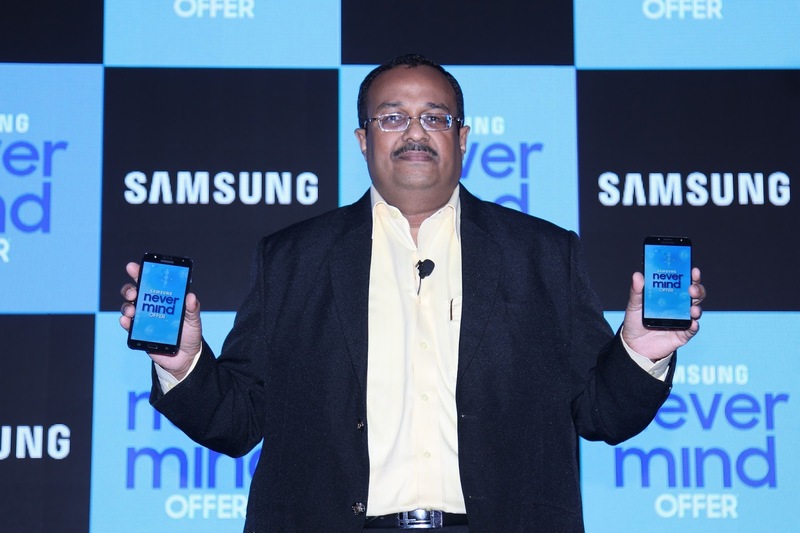 Samsung has always believed in creating value for consumers through innovative features and the latest offer bears testimony to Samsung’s commitment to consumer delight,” said Raju Pullan, Vice President, Samsung India. “Our exciting new J series of smart phones backed by Make for India innovations have helped us strengthen our leadership in Maharashtra,” he added. The recently launched Galaxy J7 Pro and Galaxy J7 Max are offered with new features that consumers have really come to appreciate. Features like Social Camera, out of the box Android Nougat and Samsung Pay have increased the appeal of Galaxy J. Every third smart phone sold in India today is a Galaxy J.
Samsung Pay is a disruptive payments platform. Samsung Pay is revolutionizing the way people carry out their day-to- day payments; transactions. Samsung Pay allows Samsung smart phone users to simply tap and pay with their phones without needing to carry the physical card. Under Make for India innovations, Samsung has also integrated mobile wallets like Paytm and MobiKwik along with the government’s Unified Payments Interface in the Samsung Pay platform. Social Camera: Both Galaxy J7 Max &amp; Galaxy J7 Pro smart phones come with Social Camera, our latest innovation which brings to the consumers a new way of sing their smart phone camera by instant sharing, instant editing and instant discovery. Make for India innovations: Galaxy J series has also been a flag bearer of Samsung’s commitment to Indian consumers. The J series’ ‘Make for India’ innovations such as Ultra Data Saving, S bike mode and S Power Planning have added immense value to J series smart phones. Samsung plans to execute the festive bonanza via its wide retail network of more than 10,400 partner stores, 235 exclusive stores and 170 service centers across the state of Maharashtra.